Remember those shelves I built for my bathroom that I shared way back when? Since I have fairly recently proclaimed the power tools in our house are MINE and have a newfound love of building things myself, I thought I’d share a quick tutorial on how I put these together for all you beginner carpenters out there. I listed every item I used at the end of the post for your reference. These are the main things you will need to consider. 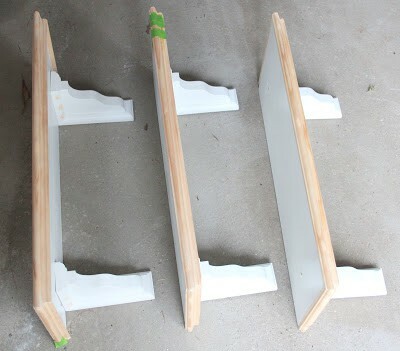 If you choose not to trim out your shelves, scroll down to Assembling The Shelves. I couldn’t decide if I wanted to go with the clean lines out a shelf without trim, or add some detail like these black cafe shelves from Ballard. I decided that I wanted to add trim to the perimeter of the shelves after all. 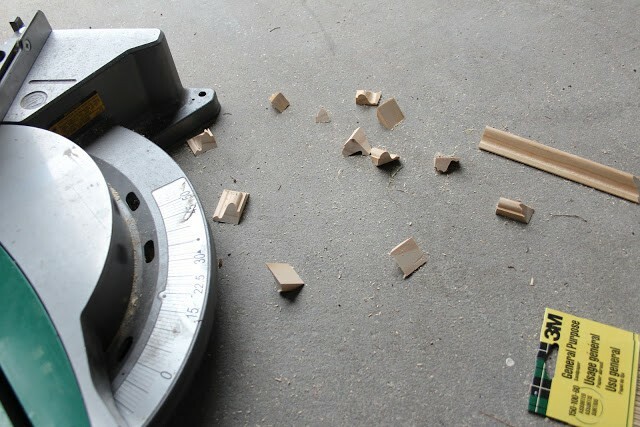 If you decide to trim out your shelves, it’s time to get out the compound miter saw. If you own a saw but have never used it, get someone in the know to give you a tutorial (some stores have free classes on the weekends) and get up your courage. If you can drive a car, operate an oven or mixer or use sharp knives……. then you can learn how to use a saw safely and proficiently! 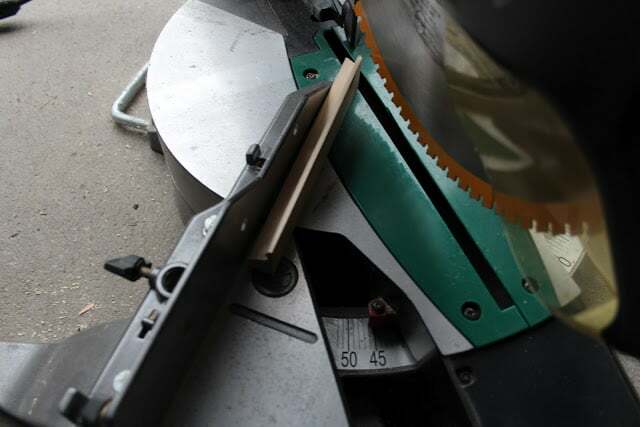 If you don’t own a miter saw, you can use a miter box to cut your trim. 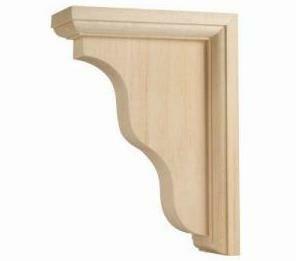 Miter the corners of your trim on 45 degree angles. Now, I said you could figure out how to use a saw and cut wood, but I can’t promise that learning how to cut angles properly is going to be a breeze. It still takes a few wrong cuts for me to get my groove on! First up, paint your shelves, bracket and trim. I decided to add trim after I had primed and painted the other pieces. These products are a woodworker’s best friends. 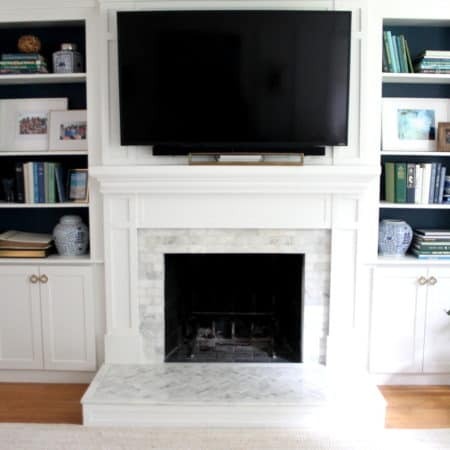 If you are trimming out the shelves, add the trim before the brackets. 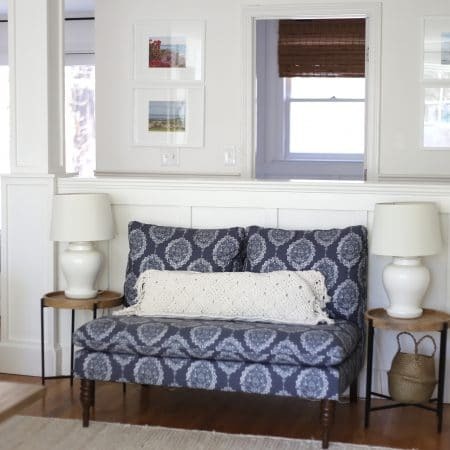 Glue each piece of trim and hold in place with painter’s tape while you attach with a nail gun or use finish nails and a gold old fashioned hammer. Next, attach the brackets. Glue & tape them into place then nail from the top of the shelf. I also added nails through the bracket shooting up into the shelf but in retrospect this wasn’t necessary. 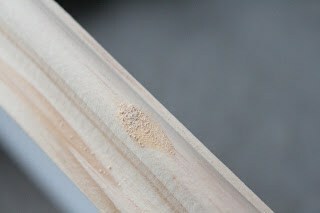 Fill nail holes with wood filler, allow to dry, sand, and then prime and paint as needed. -That piece of trim that was too short? I just cut an extra little piece, glued it in, filled the seam with wood filler and sanded it all down. -The nail that I shot through the top of the shelf by accident? I placed a flathead screwdriver on the top of it and whacked it with a hammer to invert it, then used wood filler and gave it a good sanding. -The mitered corner that was far from perfect? You guessed it, wood filler to the rescue. 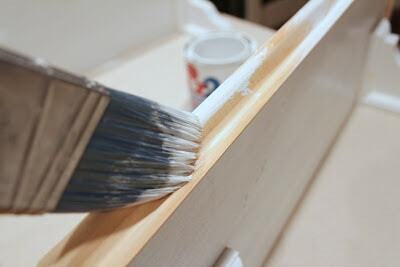 Trust me – once you have filled in your corners, nail holes and imperfections with wood filler, sanded it all down, primed and painted, your shelves will look fabulous!!! 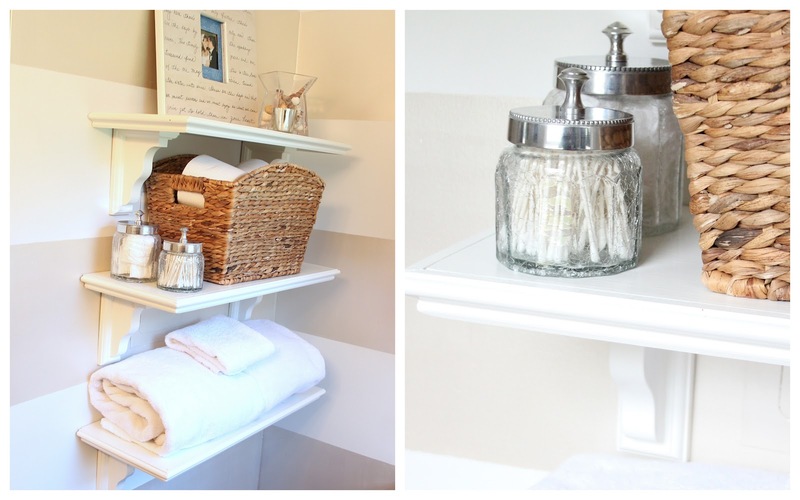 There are all sorts of imperfections on my DIY shelves, but that’s why I’m honing my amateur carpentry skills on a project for my master bathroom….only Mark & I will see the shelves up close! You will make some mistakes to learn how to do it better the next time….so if you’re just starting out, choose a project that won’t be in a public area. You’ll still get the satisfaction of having built something yourself and you will learn some mad skills for your next carpentry project!!! Was It Worth The Time & Money?? Well, let’s see. My shelves are not an exact replica of the Ballard Design Cafe Shelves, but similar. The smallest BD shelf is 3′ for $99. My shelves are only 2′ each, I have 6′ total of shelving which would cost $198 at BD if I purchases two 3′ shelves. *I had the trim, primer, paint, wood filler and wood glue on hand already. I estimate that if you don’t have these items they would cost $34 to purchase cumulatively which would bring the project cost up to $89. Gratification of building custom-sized shelves myself: priceless!! I hope this tutorial helps you to build your own shelves, or inspires you to try something new and scary! Wow, your shelves look amazing! 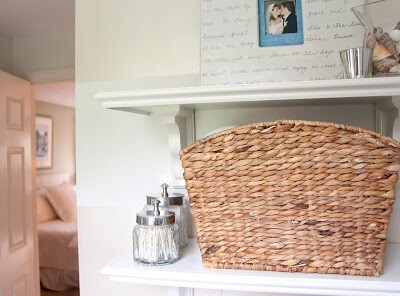 I am totally pinning this to have my husband take a lil looksie, would love to have some shelves like yours in our kitchen! Thanks for the wonderful tutorial! Hope you are having a great week! I am very impressed with your work and persistence and ability to fix imperfections. The shelves do look immaculate. I do not have the tools to cut wood so will not be attempting such a project any time soon. Perhaps some day. pride in doing it yourselves: priceless. 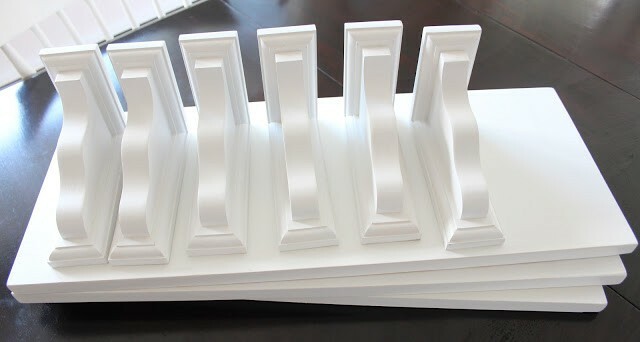 I've always loved those shelves from Ballard, great knock-off! I had forgotten how pretty your bathroom turned out! These look awesome Lisa! Great job! I'm glad that you chose to add the trim, I love that look. You are a smart one! I think the mitering is the trickiest part, I never seem to get that right the first time! What a great tutorial! I admit, carpentry still makes me a little nervous. I need to take your advice and just go for it. So impressed that was one of your first times!